The team returns to Jonas's homeworld when they learn that the Goa'uld are after its naquadria. When Jonas is captured by Anubis, Daniel is his only hope. Jack O’Neill and Samantha Carter return to the S.G.C. from Vis Uban, having successfully destroyed Anubis’s new super-weapon and helping to level the playing field a bit with the rest of the Goa’uld (“Fallen”). 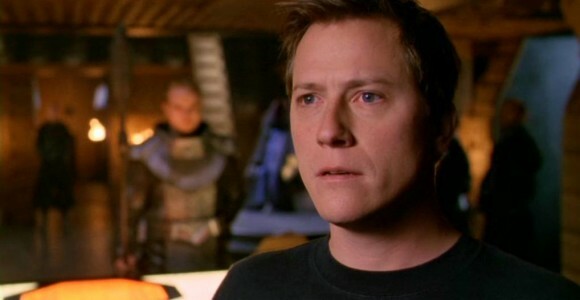 But Daniel Jackson and Jonas Quinn remain on Anubis’s ship — Daniel in hiding, with only a few hours until he is visible to the ship’s sensors, and Jonas the prisoner of the Goa’uld. Anubis implants a device into Jonas’s brain that allows him to download everything he knows — then sets a course for Jonas’s home planet. He tells Jonas that he is very interested in the element naquadria, a more powerful and volatile variant of naquadah, the mineral on which Goa’uld technology is based. He brings his massive ship into the atmosphere of the planet, hovering over Kelowna’s capital city. There is widespread panic among the Kelownans, as Jaffa spread through the city. The First Minister is executed, and Commander Hale and Ambassador Dreylock dial the Stargate to Earth and beg for assistance. The Goa’uld have arrived. O’Neill and Carter gate to the planet and assess the situation. With a Tok’ra communicator they are able to contact Daniel on the ship, and find out that Jonas has been captured. Daniel is working to find a way to free him, but the radioactive isotope with which he has been injected is about to wear off and make him visible to the ship’s sensors. 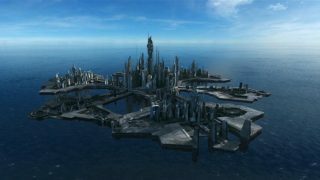 The arrival of the Goa’uld has done one positive thing for the planet: its three warring nations are now talking peace. Representatives from the Terranian and Andari have arrived at the underground bunker where the nation of Kelowna is hiding the Stargate, and are introduced to SG-1. But Hale reports that the Kelownans have given in to Anubis’s demands, and turned over their entire stockpile of naquadria. On board the ship, Anubis orders one of his scientists to begin adapting the mineral to power his super-weapon once again. Despite their acquiescence, Carter tells them that Anubis will continue to occupy their planet and enslave their people — without regard for national boundaries. Teal’c, now a prisoner of Lord Yu, speaks candidly with the Goa’uld System Lord’s First Prime, Oshu. He tells Teal’c that Yu has been growing increasingly unreliable, using the sarcophagus more and more frequently to sustain him. He is the oldest of the System Lords, and seems to be growing senile. To best serve his master and defeat Anubis, Teal’c convinces the man to turn over command of the System Lord fleet to another. They contact Baal, who agrees to a new plan. Teal’c returns to Earth to inform the S.G.C. Baal will bring the System Lords’ fleet to Kelowna to catch Anubis unawares and destroy his ship, and in exchange the Goa’uld will leave Jonas’s planet alone forever. Colonel O’Neill is hesitant to trust a Goa’uld again, but the team and the planet’s representatives consent to the plan. Anubis’s first test of a naquadria-powered weapon is a failure, and he quickly executes the scientist. What he needs is located somewhere on the planet below — a data crystal containing all the research data of the Goa’uld who experimented with naquadria on this planet a thousand years ago. Carter also figures this out, and she, Teal’c and Dreylock go to locate the jewel in a Kelownan museum storage facility. They find it, only to be immediately surrounded by Jaffa forces. On the ship, the failure of the weapons test results in a temporary power loss — freeing Jonas from his cell. He and Daniel search for a way off the ship, and Jonas remembers that one of the artifacts found on his planet was a transport ring platform. They ring down to the planet and find themselves in the storage room with Carter and Teal’c, and (thanks to the element of surprise) help fight their way past the Jaffa. Back at the underground storage facility, SG-1 learns that Commander Hale has betrayed them to the Goa’uld. Herak, Anubis’s First Prime, arrives with a squadron of Jaffa. He hands over the crystal to the Jaffa, assured that Anubis will leave his country alone. Instead, Herak shoots and kills him — then orders the execution of everyone else. Baal’s fleet emerges from hyperspace and surrounds Kelowna, firing a devastating barrage down on Anubis’s mothership. It begins to climb out of the atmosphere, but is destroyed before it can escape. Anubis himself, however, flees into hyperspace in an escape vessel. Some shots hit the city, and a skirmish erupts as the underground facility is shaken. Herak escapes through the Stargate, while SG-1 takes care of his forces. Jonas takes a staff weapon blast for Dr. Jackson, saving his life. After a visit to the S.G.C. infirmary for a shoulder wound, Jonas prepares to leave Earth. Ambassador Dreylock has invited him back home, telling him that the other nations have agreed to participate in a joint ruling council only if he is the Kelownan representative. His experience with SG-1 over the past year will be invaluable to them. He says goodbye to his friends, and returns home. VOTE! How would you rate SG-1's "Homecoming?"